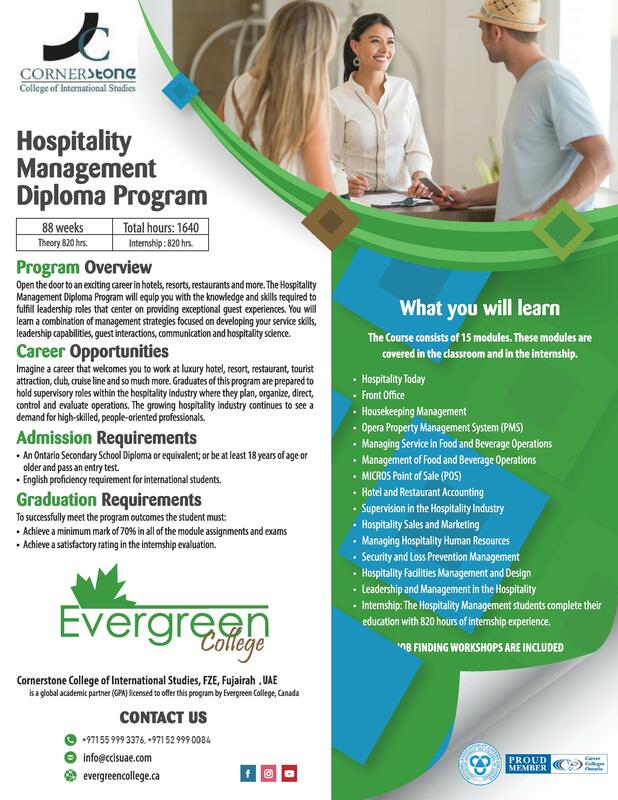 The Hospitality Management Diploma Program is designed for individuals seeking the knowledge and skills to enter the field of Hospitality. Employment opportunities for Hospitality Management exist in hotels, resorts settings, the food & beverage industry, and other service establishments. This program offers courses in Hospitality Management Theory and Practice, Service skills, Guest Interaction and Hospitality Science. This two- year program will introduce students to the hospitality industry and teach them the management principles that will enable them to achieve success in a hospitality leadership role. During the course of our Hospitality Management Program, you will train with the most recent and relevant computer software programs used in the industry, and hone your communication skills to prepare you for a career with a lot of social interaction. The Hospitality Management Students Will Complete their Education with 820 hours of Internship experience.